A big-rig carrying frozen cheese caught fire on southbound Interstate Highway 680 in Fremont Monday, prompting the closure of multiple lanes of the highway, California Highway Patrol and fire officials said. 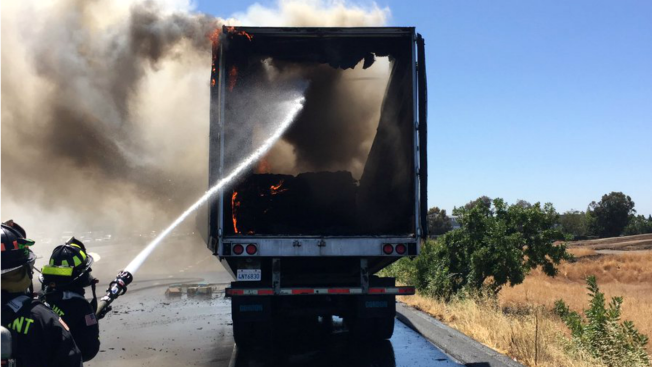 The fire was initially reported shortly after 11:30 a.m. coming from a big-rig on southbound Highway 680 near the off-ramp to state Highway 262. No injuries were reported. Fremont fire officials said as of 12:20 p.m. that the fire had been extinguished and a tow truck was at the scene. The big-rig blaze prompted the closure of the five right lanes of southbound Highway 680, with only the far left lane remaining open. There is no estimate for when the lanes will reopen, according to the CHP.